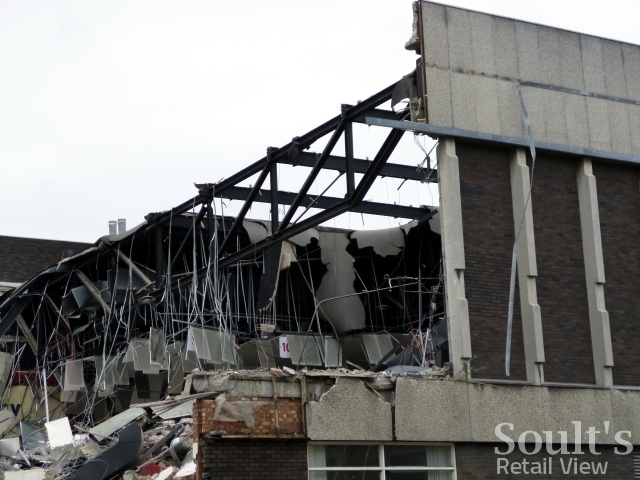 Demolition of Gateshead’s old Tesco superstore is nearing completion, just three weeks after it closed its doors to customers. 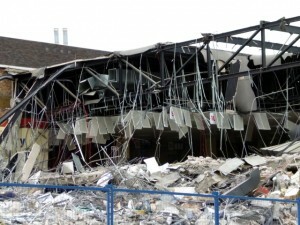 After trading from the site since 1972, the store closed on 22 April to allow redevelopment of the site to proceed. 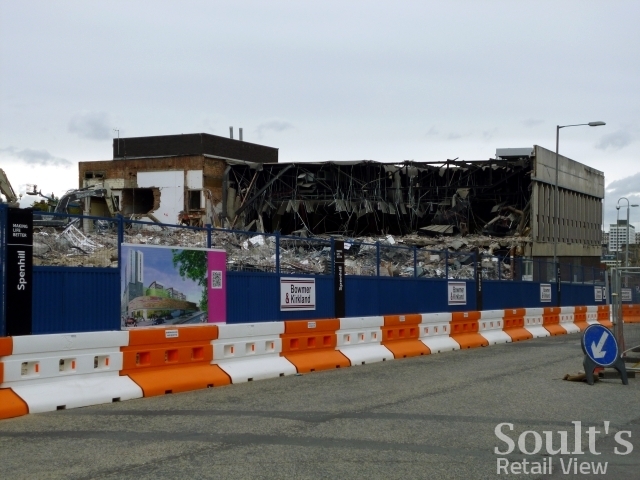 As part of the £150m Trinity Square scheme – led by Tesco’s regeneration arm, Spenhill – a much larger Tesco Extra will be opening on the site in spring next year. Given the relatively tight timescale – wih just a year between the old store closing and the new one opening – it was always likely that the closed-down store wouldn’t hang around for long. However, walking past on Sunday (13 May) I was surprised to see that the bulk of the building had already gone. 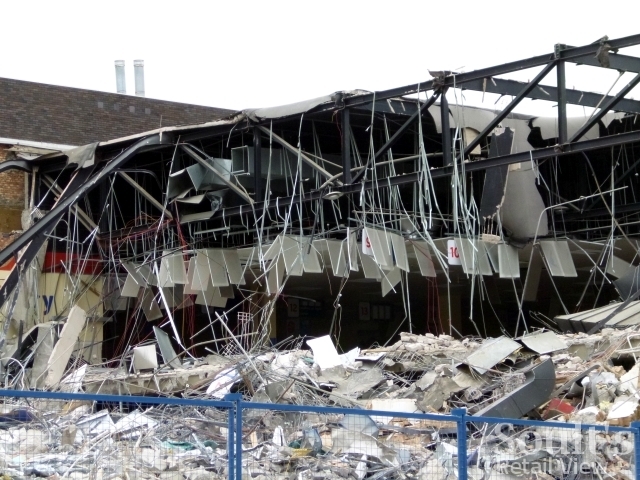 To speed things up, it looks like as little as possible has been done with the interior prior to demolition, with the aisle numbers and signage still visible, hanging eerily over all the debris. 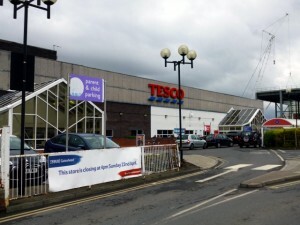 From the old Lambton Street entrance (above), a sign warns shoppers ‘Danger – Tesco now closed’, in case that wasn’t apparent to them already. However, progress can be appreciated most readily from the High Street side, where a good three quarters of the frontage has disappeared. While Gateshead Tesco is out of action for a year, shoppers are – as I noted before – having to find other options, and the much smaller temporary Tesco is now trading in the High Street’s former Kwik Save and Doggarts premises. Essentially a Tesco Express format, the store is nevertheless trading under a simple ‘Tesco’ fascia – seemingly to reflect the fact that the prices are the same as those charged in the old store, rather than the slightly elevated prices that would normally be found in an Express store. 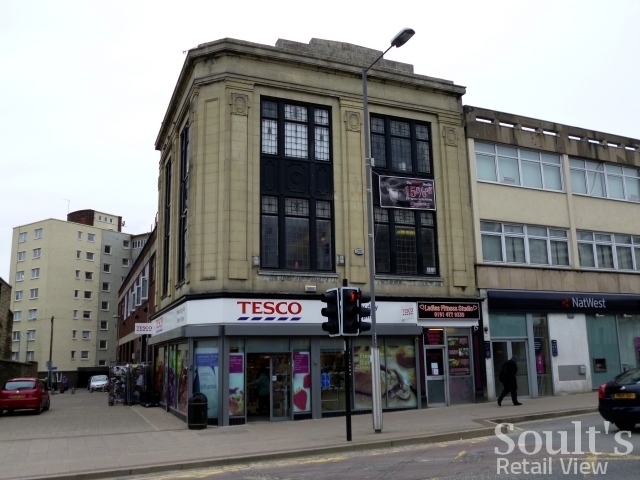 Meanwhile, I noted that the Iceland in nearby West Street has extended its opening hours, following on from Heron Foods’ refurb a few months ago; little surprise that Tesco’s local competitors are doing all they can to take advantage of its 12-month absence. 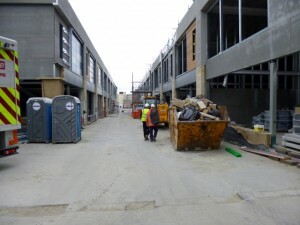 Elsewhere on the Trinity Square site, the various parts of the scheme are rapidly taking shape. 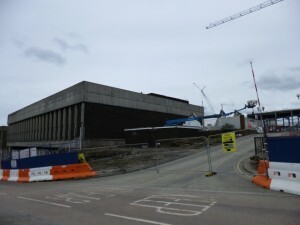 The curved forms of the student accommodation blocks have been in place for a while now (below), providing the Gateshead skyline with landmarks nearly as prominent as the Get Carter car park that they replaced. 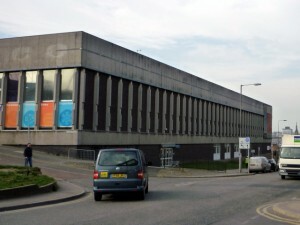 On West Street (below), new street-facing structures run all the way between Lloyds TSB and the old Co-op department store (now Argos), with a health centre set to occupy the lower stretch of this block, on part of the former Tesco car park. 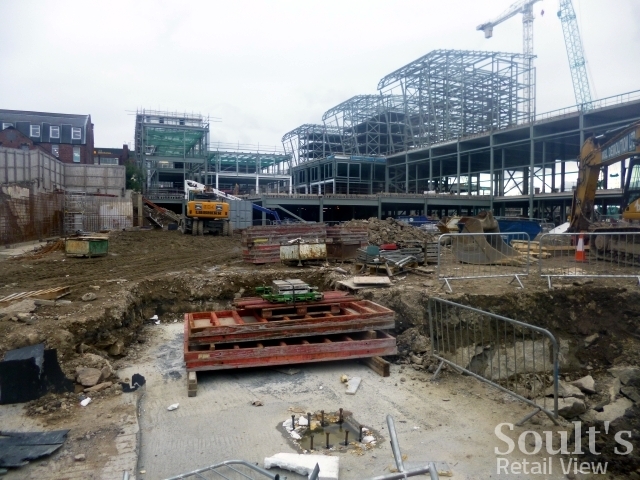 Further up, a pedestrianised shopping street, opposite the entrance to Gateshead Interchange, will connect West Street to High Street via the new ‘town square’. Cladding of these shops is progressing quickly, and it’s already possible to get a feel of how the street will work as a space. I’m not clear whether this section may open ahead of the new Tesco store, as the units certainly look like they’ll be ready in much less than a year. 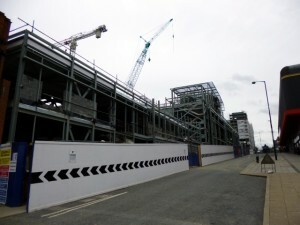 Elsewhere on site, however, the final shape of the development is still to be determined. Gateshead planners are currently considering a proposal to include a £4.7m, 24,000 sq ft, nine-screen Vue cinema as part of the scheme, taking space that had, I believe, previously been earmarked for a hotel. 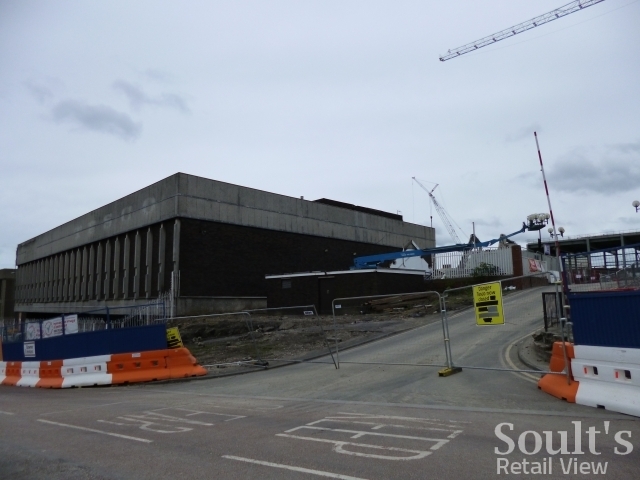 It will mark a return to Tyneside for Vue, after its former multiplex at Manors in Newcastle – which only opened in 1989 – closed in 2004 and was later demolished. Indeed, it’s a neat twist that having closed to make way for Northumbria University’s £60m City Campus East, the new Vue multiplex will have 1,000 Northumbria students living on its doorstep. 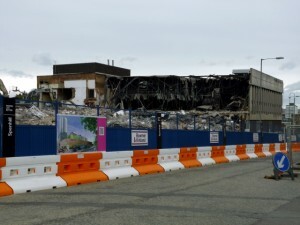 Certainly, it’s a canny move from Vue that should draw in students and locals alike, and play a part in building a nighttime economy for Gateshead town centre that has been sorely lacking to date.